He played at Chelsea when it was unfashionable but he made it fashionable. 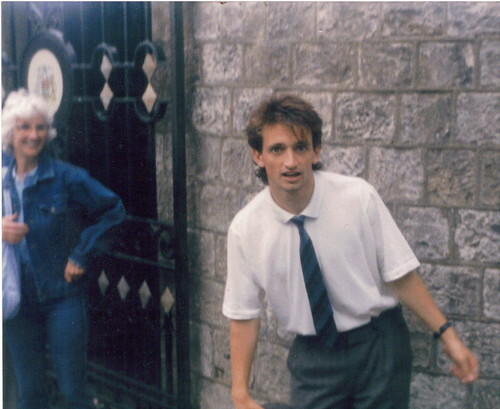 Pat Nevin was the quintessential 80’s footballer…at least with his hairstyle. Looking like he could step in for any member of Duran Duran at the time. Pat was the leader of the footie playing floppy fringes as seen to the right there (click to view closer up) and via these fine examples – this one on Flickr – and this one on the Chelsea FC site. Even though he played at the other side of Stanley Park, he hung out with John Peel too. I’m surprised, especially looking at that Chelsea FC picture (go on have a look, it will popup in a window) that it wasn’t used on an album or as a single cover. The photo is crying to be used. I’m also surprised that Tranmere’s biggest supporters – Half Man Half Biscuit, who’ve been featured on F&M numerous times didn’t do a song about him. (Tranmere Rovers was the next stop after his glory days at Chelsea and then Everton). This band called themselves The Tractors and were on Probe Plus Records at the same time as HMHB. Sadly that is all there is to know on them. There is zero other information out there. Choosing to name your band after a farming machine makes it difficult when googling for them. If any reader out there can expand on this with some history then leave a comment. With thanks to the Reverend Jim of the Plymouth Offside website for this submission. – If you have any songs done about a particular footballer not posted here yet, then please contact us. The Tractors were from St Helens,as well as the above mentioned Juggernauts E.P. they also released a 4 track 12 inch called “Some Part of Me” this was another Probe release in 1986.
one minor correction – Mr Nevin only completed one year if his course before quitting and moving to London…. oh and btw s.g.d they were not from St Helens. I remember reading once that Pat Nevin asked to be substituted early in a midweek League Cup tie in order that he could get to the ICA in time to catch The Cocteau Twins. The Tractors were too from St Helens. All still alive and well including Andy Cave. Can’t believe the sons of Dan and Fitz are commenting….when did THAT happen?